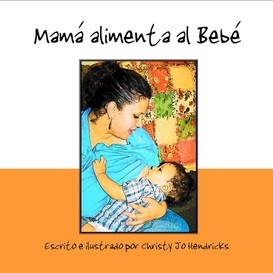 Mommy Feeds Baby by Christy Jo Hendricks, IBCLC, CD(DONA) In a country where infant formula is advertised on television, in doctors’ offices, in magazines and in hospitals, a book highlighting the natural, organic food moms provide through breastmilk is crucial. The question, “Who feeds baby?” is answered simply in every mammalian family—Mommy Feeds Baby. Christy Jo has beautifully illustrated— although contrary to what the media portrays—humans are not exceptions to what occurs naturally in the lives of all mammals. Christy Jo’s award-winning photographs of moms feeding their babies have been digitally enhanced and animated in order to captivate infants and toddlers. The repetitious phrase, “Mommy feeds Baby,” charms early readers. This book is essential for those who promote breastfeeding and desire to have excellent promotional material that is well-written, well-illustrated and well-worth a reader’s time. Mommy Feeds Baby should be in every child’s home library as well as in every public library around the country. The breastfed children and families displayed in Mommy Feeds Baby vary in age and ethnicity. Breastfeeding creates a bond between mothers and children of all walks of life. A special keepsake page is reserved in the back of the book encouraging moms to attach their own breastfeeding photograph and message as an heirloom that commemorates the precious experience.